On Saturday 5 August and Sunday 6 August we had services for the Ninth Sunday of Pentecost and in honour of the Right-believing Passion-bearers Princes Boris and Gleb (+1015 AD). All-night Vigil with the singing of the magnification of Saints Boris and Gleb was served on Saturday evening. Our parish had prepared for Bishop George of Canberra to preside at Divine Liturgy on Sunday in anticipation of the parish feast-day, but unfortunately illness prevented Vladyka from coming. 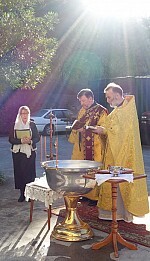 Protodeacon Constantine Moshegov served at Divine Liturgy together with our parish clergy. For the sake of the many visitors from Sydney who joined us on the day – including a group of Serbian Orthodox friends – the Lesser Blessing of Water was served before Divine Liturgy and a moleben to Saint Panteleimon was served afterwards. Around 120 parishioners and friends then gathered for a festive lunch at the Narara Community Centre.